Aside from the feeling of calmness that one could get while looking at the deep night sky, people may also witness the literal presentation of the popular folklore, “blue moon” on Friday, July 31. In general, there is only one full moon in each calendar month or within a span of 30 days. 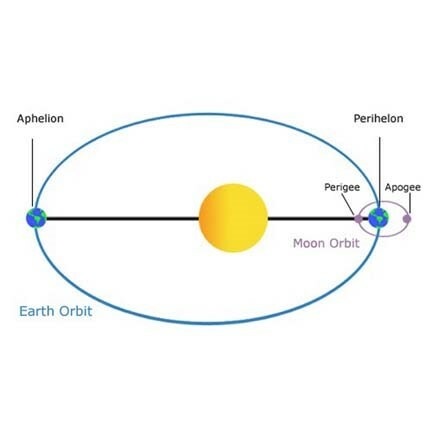 This means that a blue moon is highly emphasized if the first full moon happened during the first 1-2 days of the month and the second full moon reappears after 30 days, which is still within the same month. 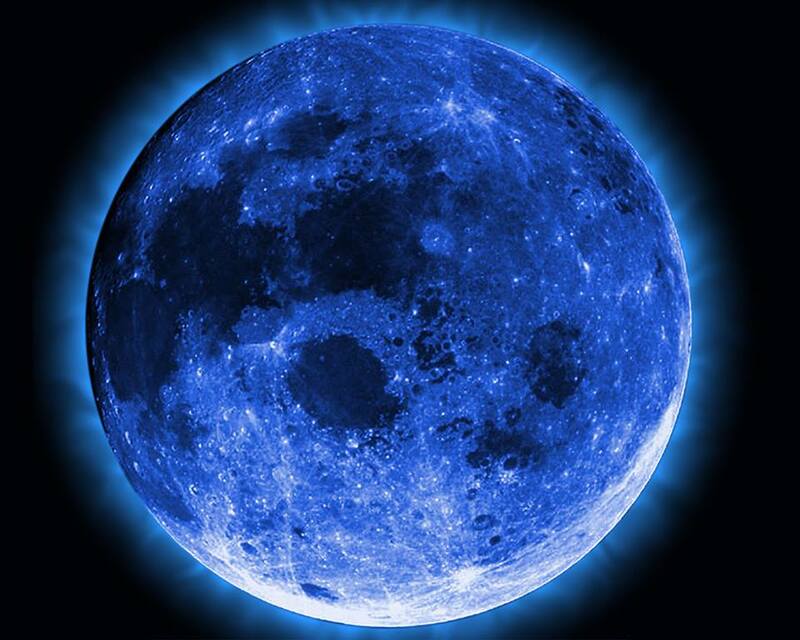 The last full moon happened in July 2, making the July 31st full moon appearance as a “blue moon.” Blue moons appear once every 2-3 years and if the modern definition is to be consulted, the last blue moon happened on Aug. 31, 2012. ‘Once in a blue moon’ is literally happening on July 31 according to one of its two emerging definitions. Experts, however, say that the physical color of the moon may not actually resemble that of the vast ocean so set your expectations straight. But the real question here is, “Is it really blue?” The experts think not. The date, period and time interval between the appearances of full moons do not have an effect on the color that the lunar object is likely to showcase. But why choose the color blue among all the other colors available in the spectrum? 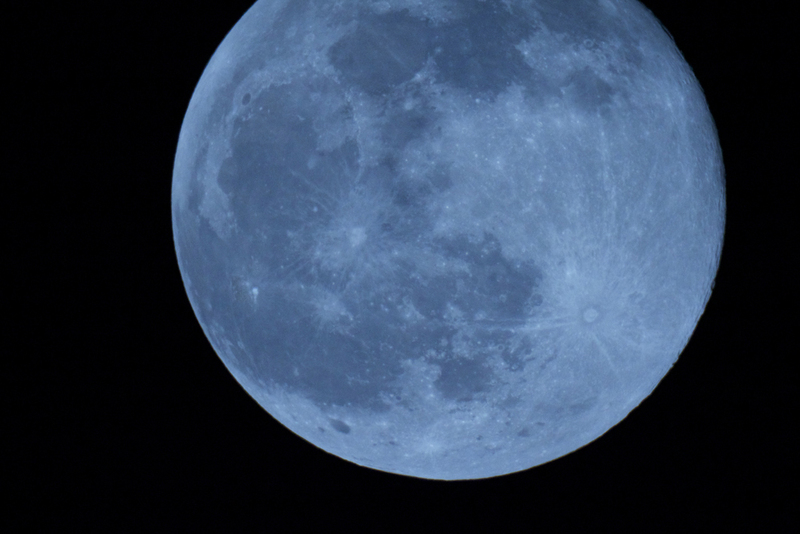 According to early literature, people used to see moons that were indeed color blue in 1883. These moons were not specifically full; crescent or half-moons also exhibited the said color, making it a daily sight, except on rare occasions when it turns green. The main reason for this is the eruption of the Krakatoa volcano in Indonesia. The experts compared the said volcanic action to a 100-megaton nuclear bomb explosion. People from nearly 400 miles were able to hear the eruption, ashes enveloped the sky massively and yes, the moon turned blue. The ashes contained particles that were able to scatter red light immensely and allow other colors to pass. The air had increased amounts of these particles that it turned the moon blue. For a bluer emphasis, the particles must be a little bit wider than the wavelength of red light. The white moonbeams glistening through the atmosphere turned blue and occasionally green. 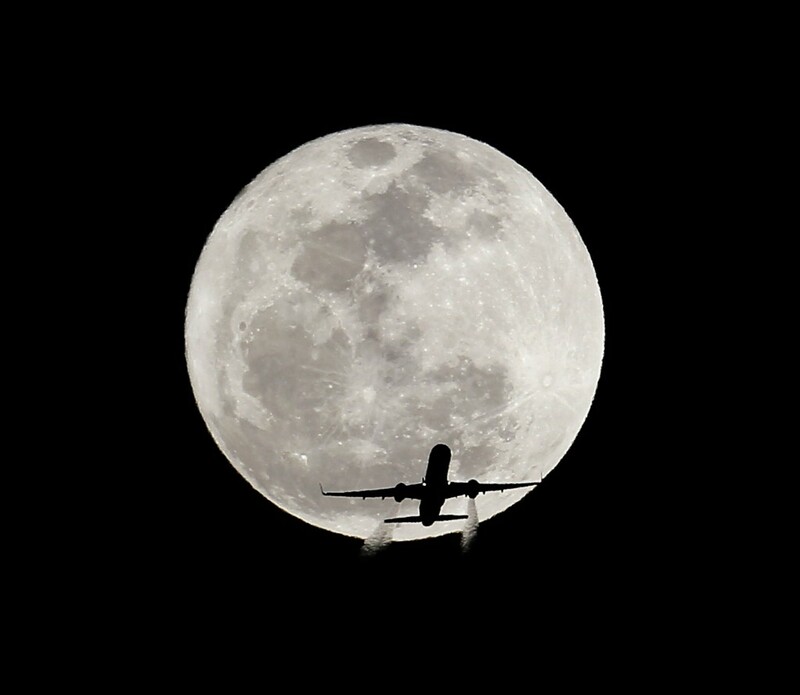 Although numerous definitions of “blue moon” have emerged, it all points out to one thing: a blue moon is indeed rare and with its reported appearance at the end of the month, people could have another reason to look up in the sky as a new month begins. 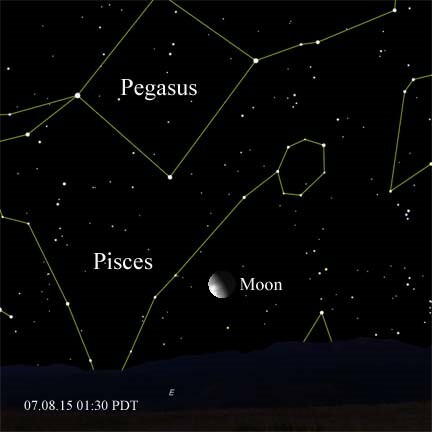 Today an 18.5-day-old 85% illuminated waning gibbous Moon is at perigee, at 11:54 A.M. This is its closest point to earth in this orbit of our planet. When the Moon is full at perigee, it has been referred to as a Supermoon. See the Moon best today before sunrise. It sets just before 10 a.m. Look carefully and try to see it during the day. This morning in the early sunrise, Earth reaches Aphelion. It will be 1.017 AU (Astronomical Units) from the Sun at 05:59 PDT. This is its farthest point from the Sun in our planet’s elliptical orbit. Pluto is at opposition today. The Earth is directly between the dwarf planet and the Sun. So, Pluto rises at sunset today, is up all night, and sets with the next morning’s sunrise. 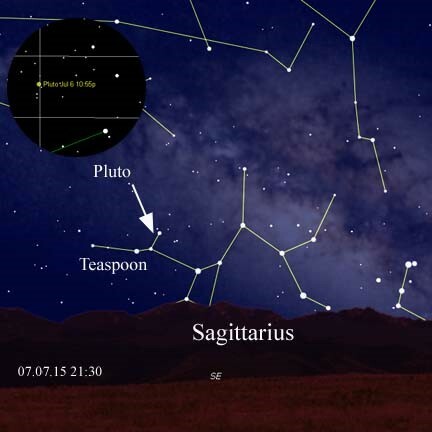 Pluto is in an easy to locate position, right off the tip of the Teaspoon in Sagittarius. The above image shows its position relative to the nearby bright star. Even with this help, Pluto will look like a dim star in a telescope. But, with the New Horizon space probe visiting this distant world on in just one week, this may be a fun target to pursue! The Last Quarter Moon occurs at 13:24 today. It will be slightly larger than half illuminated in the early hours when it rises over the eastern horizon in Pisces, below Pegasus. Last Quarter is tacitly the beginning of a dark sky observing window, for deep sky observers, lasting until after New Moon. 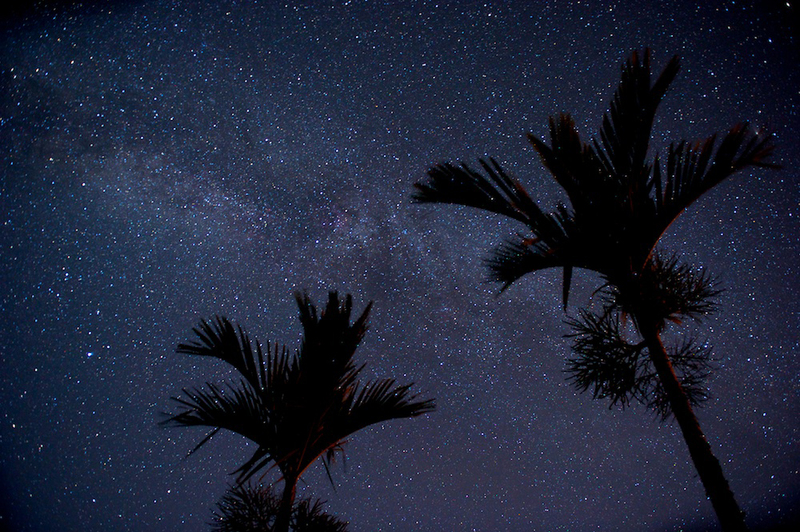 Get your telescopes out and let us know what you’re looking at! 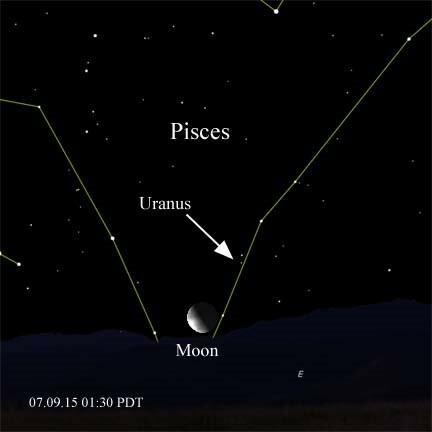 Before it rose, just after it 1 a.m. this morning, the Moon occulted the seventh planet Uranus. 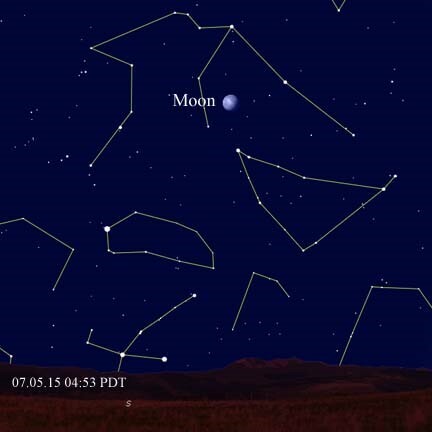 Look at yesterday’s Moon position and you can see how its path to today’s location crossed over the planet. Uranus is in an easy position currently, for star hoppers to get to, just off the two brighter stars in the western string of Pisces. Wait for the moon to move away over the next few nights, and add Uranus to this week’s planetary targets. Did you all enjoy the Venus and Jupiter conjunction last week? It won’t occur again until 2023, so it was really a special treat! Still, the two planets are close together, setting after evening twilight. 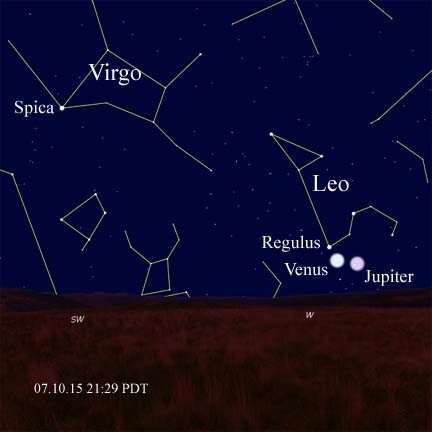 Continue to watch them move further apart, as Venus approaches Leo’s bright star Regulus, along the Ecliptic, as is Virgo’s Spica. 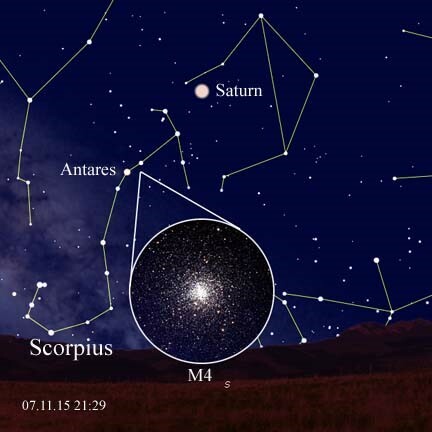 Due south an hour after sunset, the great globular cluster M4 is easy to view, just off Scorpius’ giant red star Antares. One of the closest globular cluster’s to our position in the Milky Way Galaxy, it is thought to be some 9,000 light years distant. Although it is a Messier object, in the famed French comet hunter’s catalog, it was discovered in 1746 Philippe Loys de Chéseaux. It was the first globular cluster in which individual stars were seen. At magnitude 5.9, this is at the threshold of most people’s sight. Don’t forget to visit nearby Saturn too, if you are in the area. The Full Moon of April falls on the 15th of the month. As we look forward to the total lunar eclipse on the night of the 14th-15th, let’s observe the Moon before it’s completely full. After all, the best time to observe the Moon is when there is still a line of shadow falling across it. On Saturday, April 12, the Moon is waxing gibbous at 12.68 days old, and 95% illuminated. Below are detailed images and description of those areas. These are fun to view in a telescope under good conditions. I’ve heard people say the view feels like flying over the lunar surface! Grimaldi is visible in 10 power binoculars. It is a very dark circular formation, appearing much like a sea, or Mare. 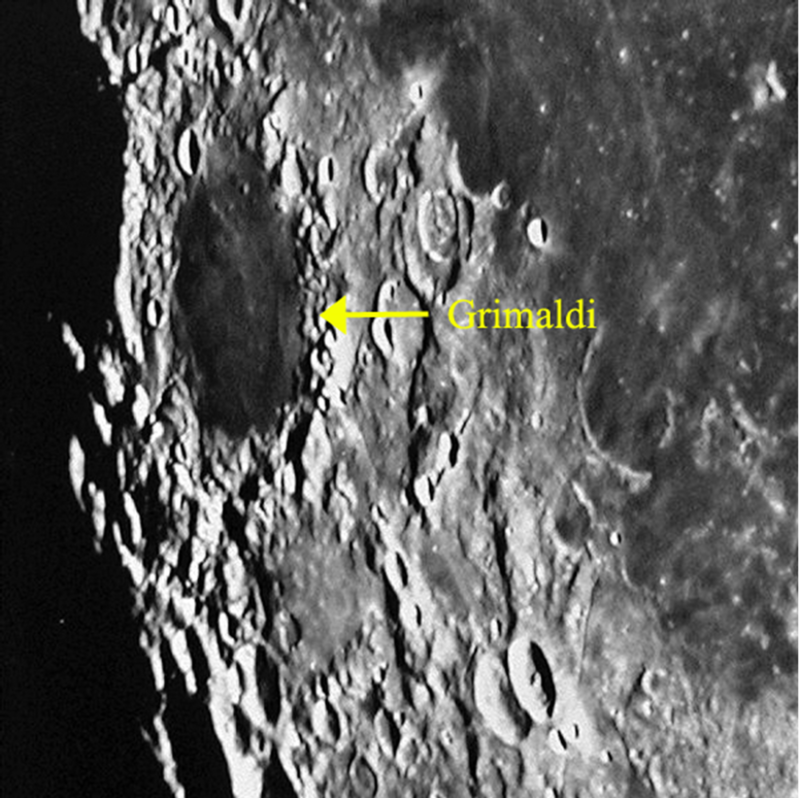 You may see a number of small craters on its very flat and smooth floor, Grimaldi also has very high slopes, with pock-marked craters embedded in them. This is a great time to pick out details. 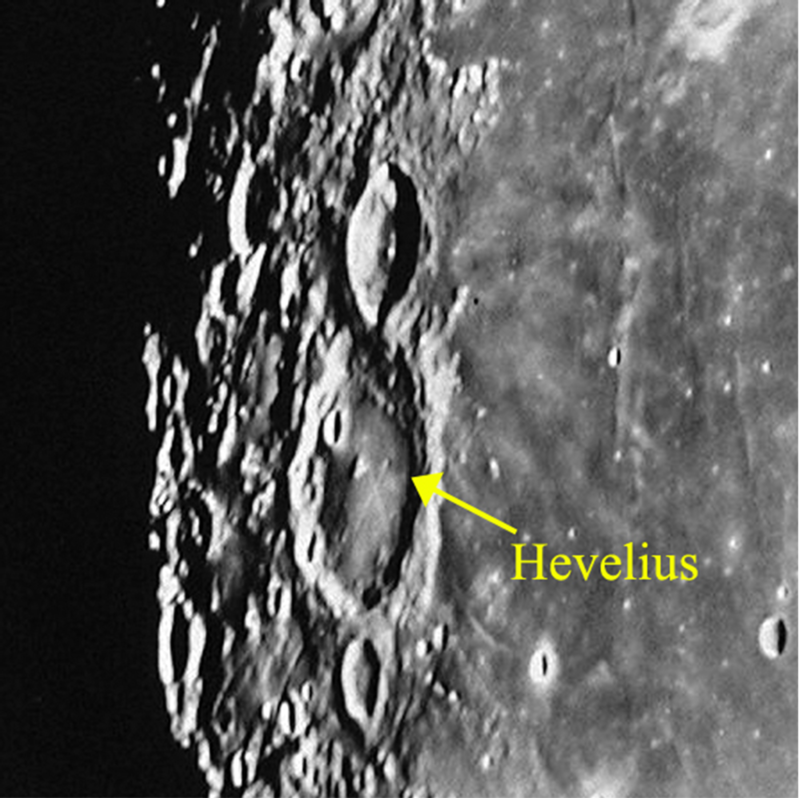 Hevelius is very close to Grimaldi, and forms a nice pair with Cavalerius just above it in this image. 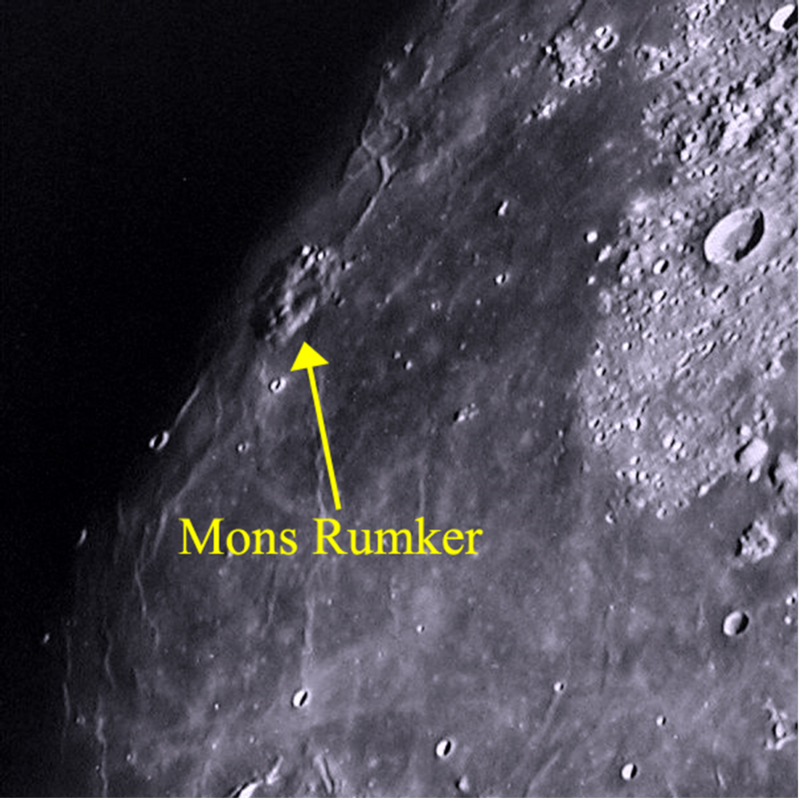 This crater too has steep slopes embedded with many small craters. The floor has a small central peak. See the cross-marks near the central peak? Those are part of Rimae Hevelius, rilles that criss-cross the floor. 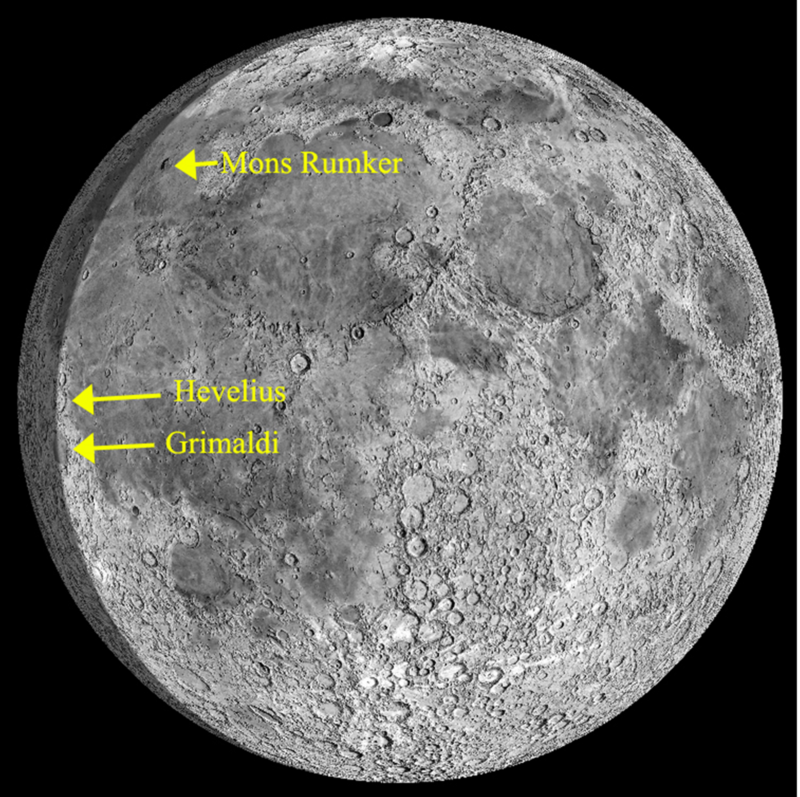 The main crater can give pleasing views in a 10 power binocular, but for details such as the rilles, you’ll need something more like a 12″ telescope. There is so much to explore on the Moon, and following the Terminator makes it all the more enjoyable, since it is the area of highest contrast between shadow and light. The features really pop out in 3D. On tonight’s map at the start of this article, I point out Porrima – Gamma Virginis. 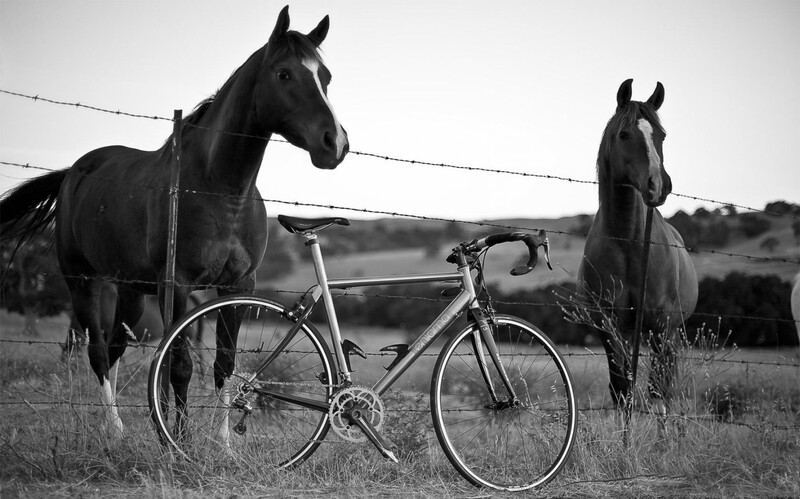 This is a wonderfully tight double star. During my years observing, it has gone from a 2.5 arc-second separation (1995) to 0.4 arc-second in 2008. In 2010 it was back to 0.9 arc-seconds and now is back to over 2 arc-seconds, and significantly easier. You can “split” this double star now in a 50mm telescope. It is a true binary star, where both members are bound together by gravity, shining individually at magnitudes 3.6 and 3.5. They shine at a combined magnitude 2.6, 39 light years distant, and have an orbital period (around their common center of gravity) of 169 years. Gamma Virginis is a star you’ll enjoy watching year after year – as you can watch the changes in separation. 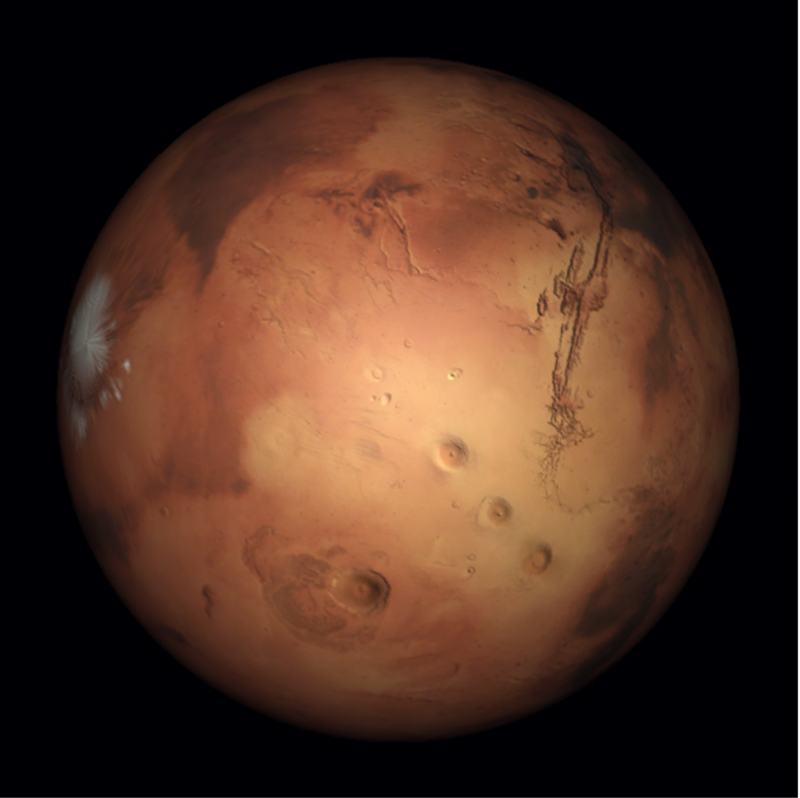 Tonight is a another great time to observe Mars. The good news is, even tonight’s big Moon won’t interfere with your views. Get your scope, family and friends out, because tonight is an observing delight! Images courtesy the Lunar and Planetary Institute From The Consolidated Lunar Atlas. Mars image from Starry Night Pro.